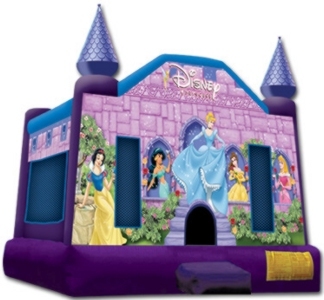 This Disney Princess Moonwalk, Bounce House will entertain for hours. Kids can jump away the day with all their friends. After all, Busy Kids Make Great Parties! This is a licensed Disney Princess that brings the famous princess to life at a larger size for larger groups it is 15 foot by 15 foot. This jumper boasts breathtaking artwork. Children love to be with there favorite friends.